Chattahoochee, Coosa River’s Water Quality At Risk In Ga. The Chattahoochee River National Recreation Area near Medlock Bridge. The Chattahoochee River is one of the major rivers at risk, according to the Georgia Water Coalition. In August, the state got rid of a minimum water flow requirement. The Georgia Water Coalition’s 2015 Dirty Dozen list. In the Atlanta region, the Chattahoochee and the Coosa Rivers are the problem children when it comes to water quality, according to the latest “Dirty Dozen” report from the Georgia Water Coalition. The list highlights what it considers the 12 biggest water quality problems in the state. The Chattahoochee River runs 436 miles from the north Georgia mountains, down through Atlanta and into southwest Georgia. The state’s environmental agencies, Georgia’s Environmental Protection Division (EPD) and the board of the Department of Natural Resources, voted in August to eliminate a 40-year state requirement at that river. The state used to require a minimum water flow of 750 cubic feet per second where the Chattahoochee River and Peachtree Creek in Atlanta intersect. The Georgia Water Coalition said it’s essentially a water grab in the latest of the state’s water wars with Alabama and Florida. “Through this decision, metro Atlanta won, everybody downstream lost,” said Chattahoochee Riverkeeper Jason Ulseth. He said the state can now hold back more water as a reserve in the event of a drought, but there’s no way to tell yet how that will affect the Chattahoochee’s water quality long term. Georgia River Network’s Chris Manganiello said there was a reason for the minimum. “Since the 1970s, that minimum helped protect the health of the river downstream from Atlanta, where more than a dozen sewage treatment plants discharge into the river,” Manganiello said. Chattahoochee Riverkeeper Jason Ulseth said before eliminating the water flow minimum, the state should have completed studies on how the change would impact fish, visitors who use Lake Lanier for recreation and whether the sewer discharges will still be diluted enough by the time it gets to downstream residents. The river provides drinking water for nearly 4 million people, or 75 percent of Atlanta area residents. The Sierra Club of Georgia visited Plant Hammond in May. The Georgia Power coal-fired plant withdraws up to 590 million gallons of water from the river each day and releases hot water, according to the Georgia Water Coalition. 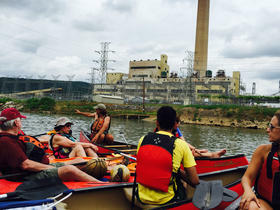 As for the Coosa River, in northwest Georgia, the Georgia Water Coalition said a Georgia Power coal-fired power plant, is killing up to 60,000 adult fish each year near Rome. In 2004, the Environmental Protection Division said cooling towers were needed at Plant Hammond to reduce the hot water discharge into the river. “The funding is tied to the political will. If you had an administration that made environmental protection of our rivers and streams a priority, perhaps we would get more funding for EPD and these continuing problems would get corrected in a more timely manner,” Cook said. The list includes a bonus: something the Georgia Water Coalition thinks the state did right. The Georgia Water Coalition said the 360-mile Palmetto Pipeline might have impacted drinking water for 1.8 million people and sensitive wetlands along the Georgia Coast.